Rodents can carry serious diseases and they are instinctively wary of traps and bait. 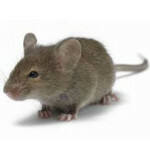 The most common include: House Mice, Norway Rats and Roof Rats. Appearance: Black or brown, seven to 10 inches long, with a long tail and large ears and eyes, with a pointed nose; body is smaller and sleeker than Norway rat; fur is smooth. Habits: Nests inside and under buildings, or in piles of rubbish or wood; excellent climber; can often be found in the upper parts of structures. Diet: Omnivorous, but show a preference for grains, fruits, nuts and vegetables. Reproduction: Becomes sexually mature at four months; four to six litters per year; four to eight young per litter; live up to one year. Other Information: Very agile; can squeeze through openings only 1/2 inch wide; carry many serious diseases.